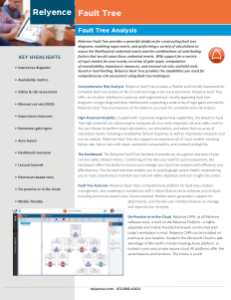 The complete fault tree software tool for comprehensive risk and safety analysis. The Relyence Fault Tree Analysis tool offers a comprehensive platform for constructing striking FTA diagrams, modeling an array of input events, and computing a wide range of availability metrics using its highly capable mathematical engine. Relyence’s high-powered fault tree analysis probability calculator back-end computes all your most important risk and safety metrics with speed and accuracy. The mathematical engine supports both exact calculations as well as simulations. Create well-organized and visually appealing diagrams with our intuitive and efficient interface. The Relyence software for fault tree analysis optimally configures your tree, auto-aligns, and auto-connects gates and events. The Relyence Fault Tree Analysis software provides a flexible and friendly framework for complete analysis of small and large scale risk assessments. Relyence provides an intuitive interface to construct well-organized and visually appealing diagrams and supports a wide array of logic gates, events, and input models. The front-end user interface is matched with an equally impressive computational back-end mathematical engine. Relyence’s locally-installed or online fault tree generator tool provides a comprehensive platform for constructing diagrams and performs a variety of calculations to assess your most critical availability metrics for effective risk analysis. It supports a variety of input models, an array of gate and event types, CCF groups, and disjoint events. Numerous risk metrics can be computed, including minimal cut sets (MCS), unavailability, and importance measures. Relyence Fault Tree’s comprehensive platform for performing fault tree analysis probability calculations is rounded out with a robust feature set to enhance your analysis, including flexible report generation, the ability to export to Excel, features to manage and organize large-scale fault tree diagrams, support for repeated events, and customizable dashboards for high-level overviews. Take us for a test drive. No commitment, no hassle. Just sign up today to see Relyence in action. Our two-week fault tree analysis free trial requires no download or installation and includes all the features and functions of our complete package. Or, if you’d like a personalized demo, feel free to call our team today to schedule a time. You won’t be disappointed! Discover the unparalleled features that make Relyence FTA software the choice fault tree analysis tool for risk assessment. Fault Tree Analysis (FTA) is a top-down, deductive technique used to determine the probability that undesired events will occur. FTA software techniques are used for processes, products, and systems. Relyence supports a comprehensive set of logic gates including commonly used gates such as AND, OR, and NOT, as well as specialty gates such as Priority AND, Voting, and Transfer gates. Our FTA software also supports Basic events, House events, Undeveloped events, as well as Repeated events that allow you to model the same event occurring in multiple branches of your tree. Relyence Fault Tree expertly performs calculations by employing exact calculations if possible, or engaging the simulation engine if needed. Output results include a comprehensive list of risk metrics, as well as importance measures and cut-sets. Relyence Fault Tree and Relyence FMEA can be used as a powerful combination pack for risk analysis. You can automatically generate fault trees from your FMEAs and expertly track and assess all of your most critical risk items. Relyence is easily incorporated with your existing systems. Through flexible report creation that supports a variety of output formats, to API functionality support, Relyence is designed to be an integral part of your product management lifecycle. Relyence Fault Tree Software’s Dashboard gathers and organizes your data for a holistic overview. View the gates with the highest or lowest unavailabilities, the top 10 highest probability gates or events, and much more. Built with team concepts in mind, Relyence allows access to your analyses anytime, anywhere, and on any device – including your mobile devices. Collaboration and connectivity are at the heart of Relyence. Relyence Fault Tree is also available as part of the Relyence Studio Platform – our fully integrated platform for all your reliability and quality tasks. Data integration is seamless and cross-module dashboards provide an all encompassing overview. Relyence Fault Tree is built to handle the needs of fault tree analysts in a broad range of industries – from the mission critical applications in the military, aerospace, and defense industries, to the high risk assessments needed in the nuclear, medical, telecom, oil & gas, industrial, manufacturing, and commercial sectors. Our complete FTA modeling tool supports a comprehensive list of gates including AND, NAND, NOR, NOT, Inhibit, XOR, Priority AND, Transfer, and Voting; as well as Basic, House, Undeveloped, and Repeated events; and an extensive list of input models including asymptotic unavailability, constant mission time, constant probability, failure rate, failure with repair, frequency with failure rate, lambda tau, latent repairable, and mean unavailability. When unwanted events can spell disaster in mission critical situations, the use of Fault Tree Analysis (FTA) to predict the likelihood of such failures is a proven technique for risk assessment. Fault tree analysis is a preferred technique for assessing risk in situations where safety is paramount and the probability of catastrophic events must be minimized. Fault tree analysis is used in the nuclear power, military, aerospace, defense, and medical industries – where risk and safety issues are of utmost importance, and in some cases may even be kept in compliance with regulatory guidelines. Even in commercial industries where the severity of failure may not be as catastrophic to be life-threatening, the principles of fault tree analysis can be applied for risk assessment. Fault tree analysis is also frequently used in the telecom, automotive, oil and gas, and many other industries to due to its well-proven methodology. The benefit of fault tree analysis is to assess risk in order to eliminate, minimize, or mitigate events that lead to catastrophic system failures. 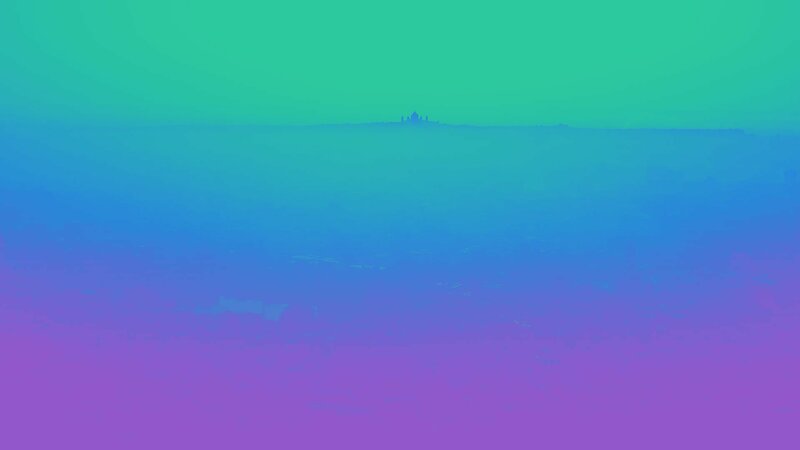 The goal is to keep the probability, or likelihood, of the critical events as low as possible. The ability of fault tree analysis is that you can obtain quantifiable metrics to be sure your risk and hazard rates are under control. Best-in-class fault tree software needs to be flexible, powerful, and visually engaging. The front-end diagramming function must be easy to navigate and result in well-organized and optimally configured trees. Automated abilities, such as optimizing layout and auto-connection, are desirable. Additionally, the features that aid in handling large trees, such as support for transfer gates and linked sub-trees is critical. Because FTA software can serve as a vital tool in risk assessment and mitigation, the ability to model real-world scenarios is important. This means that a variety of logic gates and events must be supported, along with a solid list of input models to choose from. Support for more advanced modeling features such as CCF (Common Cause Failure) groups and disjoint events are also beneficial. The core feature of any fault tree tool is the ability to accurately calculate risk metrics. The calculation engine needs to be fast, reliable, as well as accurate. A variety of calculation methods should be available: exact (analytical), cross-product, cut-set summation, and Esary Proschan. The mathematical engine must be able to support simulation as well to handle complex scenarios where analytical results are not possible. Additionally, an array of output results should be supported – such as unavailability, failure frequency, number of failures, and minimal cut set evaluation (MCS). Report features should include graphical output results as well as numeric table-based output. Added bonuses include features such as a dashboard for insight and overview of important metrics, the ability to install on-premise or online depending on your needs, and an API interface for integrating with other quality systems. See for Yourself: Begin Your Fault Tree Software Free Trial Today! 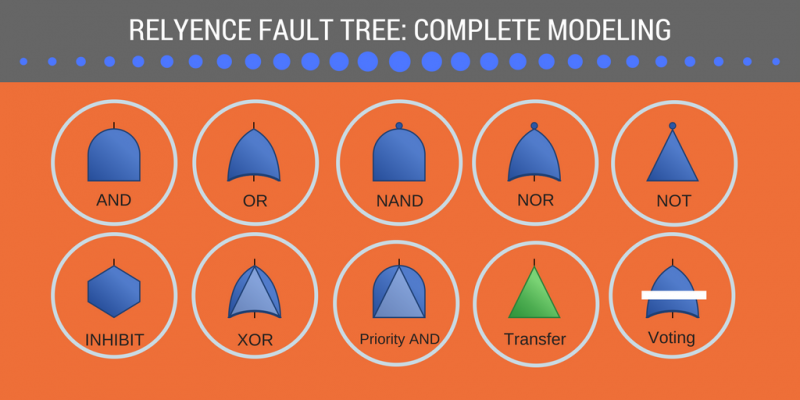 Ready to see how efficient and powerful fault tree analyses can be with Relyence Fault Tree? We offer a no hassle, no obligation, fully featured, completely free two-week trial. Here’s your opportunity to see the Relyence Advantage for yourself. 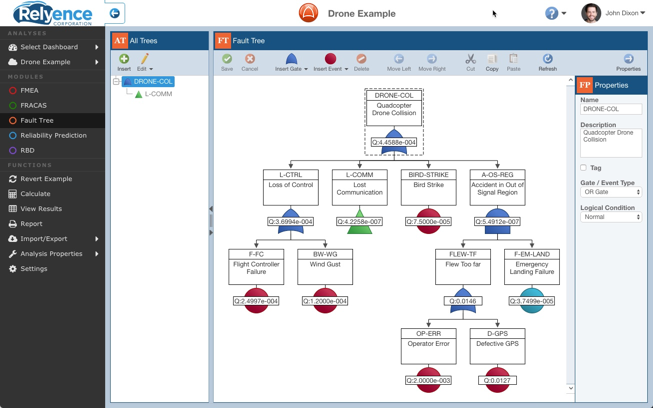 To better manage all of your reliability and quality needs, Relyence Fault Tree can be used as part of the Relyence Studio platform that integrates FMEA (Failure Mode and Effects Analysis), FRACAS (Failure Reporting, Analysis, and Corrective Action System) software, Reliability Prediction, and RBD (Reliability Block Diagram) modeling into one impressive package. Sign up now to start your free trial! You won’t be disappointed! Check out our blog for more information on FTA analysis, Relyence Fault Tree, and other reliability & quality topics.